This is a plant we call Sandy. The reason is that this plant was outside on our porch in Lavallette, New Jersey, when Hurricane Sandy hit. Although there was damage all around, the plant was still in tact. (It has always had a slight lean to it!). After the storm we brought the plant inside the house but we were not permitted access to the island for a few weeks and there was no water, heat or electricity for several months. Throughout the cold winter of 2012 she not only survived…but seemed to thrive. A new, second root began to grow. Since last year the plant just seems to be getting stronger and stronger. And that is not due to plant care. As Donna Bolster knows, that is not our strong suit (we are thankful for Donna’s caring for our plants at the church!). We hardly water Sandy and this winter the temperature in the house has been around 50 degrees just so the pipes don’t freeze. Not exactly plant growing weather. 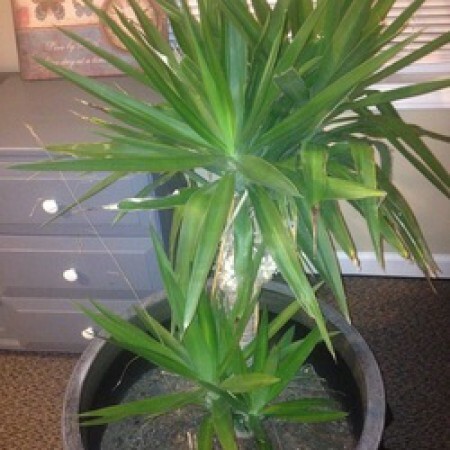 It is a Yucca plant…a genus of perennial shrubs used for landscaping and design. It is commonly found in the South and Mid West in dry and arid regions and grow best in sunny, warm environments. Not in cold, damp, hurricane damaged homes! We like to keep this plant as a symbol of survival and how, even against the odds and in the midst of unnatural conditions God is at work. There is life and growth happening in spite of….or maybe because of…the horrid conditions. Jesus said: “I have told you these things, so that in Me you may have peace. In this world you will have trouble. But take heart! I have overcome the world.” (John 16:33). No matter what the situation, how hopeless or how antagonistic, God, through the power of His Holy Spirit, has built us to not only survive but to thrive in this life. Jesus has overcome the world! Our plant will always serve as a reminder of that.